Buy Continuous belt tea dryer sterilizer/industrial tea microwave oven with high quality - Shandong Leader Machinery Co.,ltd. Our Energy saving Continuous belt tea dryer sterilizer/industrial tea microwave oven with high quality can dry and sterilize all kinds of food,including the leaves,the vegetables,the grains,the spices and so on. As for the leaves,it includes tea drying drying sterilizing,black tea drying sterilizing,green tea drying sterilizing and several flower tea drying sterilizing.What is more, the effect of microwave sterilizer is good. 2, uniform heating, The tea are exposure to the electromagnetic waves produced by magnetron,no coke leaves, coke and unqualified.As for the traditional tea drying sterilizing,it is heated unevenly,influence the quality of the tea heavily. 4, sterilization, alcoholization: pick the tea, the production process, often have the possibility of secondary pollution, filming for the microwave, drying have the functions of sterilization, alcoholize and traditional craft equipment does not have this feature, microwave special for summer, autumn tea, remove an indication, is quite effective, this alcoholize function, other mechanical is irreplaceable. 5, the tea quality improvement: tea when filming for the microwave surface temperature is not high, does not need cooling at the time of the leaf, leaf changes little, colour and lustre is green hide, aroma loss, less dry even, at the same time due to moisture evaporation speed, easy to form porous, product with good water complex insoluble substance soluble in the tea. 6, to reduce the labor intensity, improve work efficiency. this equipment adopts automatic upper and lower feed, the operator simply press a button, monitor equipment operation condition and patrol filming for the fresh leaves of degree can, filming for the whole lead, dry only 1 or 2 people.And traditional editing, dry work labor strength, bad work environment, filming for the whole drying should be 5 to 6 people. 7, pollution-free, environmental protection equipment, By practice has proved that the filming for the microwave, drying equipment, production of tea, its shape, colour and lustre, rinsing fragrance and other factors.It is better than traditional production, has increased significantly in sterilization and shelf time, facilitate storage, is very popular with consumers in the market.Microwave tea, therefore, is a revolution in tea processing machinery and equipment, once again leap, is the tea makers, improve product quality to build brand, strengthen the market visibility and competitiveness, to create a pollution-free, environmental protection enterprises, etc, the preferred green production equipment. 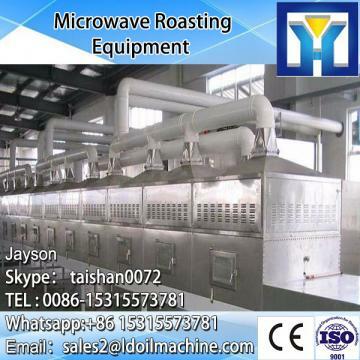 Our company has engaged in producing and exporting Continuous belt tea dryer sterilizer/industrial tea microwave oven with high quality for many years, and until now, our machine has exported to overseas market, such as Brazil, India, Indonesia, Russia, Thailand and so on, and get the foreign customers' unanimous praise. We believe that you purchase shandong leader machinery co.,ltd. Continuous belt tea dryer sterilizer/industrial tea microwave oven with high quality is your best and sensible choice.